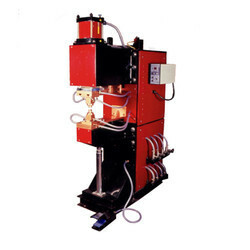 Leading Manufacturer of press type pneumatic spot projection welders from Mumbai. Water Supply At 30 Degree C pressure 2.1 kg./ cm2 at 9 Itrs / min. Press Type Projection welding machine is Pneumatically operated with water cooled heavy duty Transformer with Robust Body Structure. Fixtures, Jigs and special attachments suitable to the job can be designed to give fast & accurate production output. SparkLine also manufacturers special purpose projection welding machines. Water Supply At 30 DegreeC pressure 2.1 kg./ cm2 at 9 Itrs / min. Looking for Press Type Pneumatic Spot Projection Welders ?